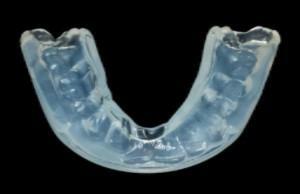 Mouthguards help protect your smile while playing sports in Issaquah. If you or your child play sports, protecting the teeth with mouthguards is essential. This practice is so important that the American Dental Association has advocated for it since the early 1990s. Sports can be unpredictable, and being hit in the mouth with a baseball, hockey puck, bat, hockey stick, or another piece of equipment can have devastating consequences. It only takes a second to lose teeth or sustain a serious injury to the mouth. Dr. Vanama is happy to help you evaluate your options in mouthguards as well as demonstrate how to wear one properly. This is a general purpose type of mouthguard that is appropriate for playing several different types of sports. The device has poly-shock technology to absorb greater impacts than other types of mouthguards. It has built-in extra protection for the front teeth and is available is a wide variety of sizes, styles, and colors. This allows athletes to match their mouthguard to the rest of their uniform. Your dentist in Issaquah helps to make customized mouthguards. She starts by taking an impression of your teeth and then sends it to our laboratory for fabrication. This type costs more than the others, but it offers superior comfort and protection. We normally don’t recommend this type of mouthguard at Discovery Dental. That is because it can be bulky, make breathing difficult, and is not adjustable. These mouthguards are the least expensive, but they also offer minimal protection. You should wear a helmet in any contact sport or where you run the risk of accidental blows to the head. This includes team sports such as football, baseball, and hockey as well as solo sports such as biking, skating, and skiing. Helmets not only protect your head and reduce the risk of brain injuries, they also offer extra protection for your mouth and teeth. If you enjoy competitive or solo swimming, try to keep your mouth closed as much as possible to prevent damage from chlorine in the pool. I had a really good experience at Discovery Dental. It's a great place, friendly, quick and clean and painless. The mouthguard that you ultimately choose should fit well, be resistant to tearing, and feel completely comfortable to wear.